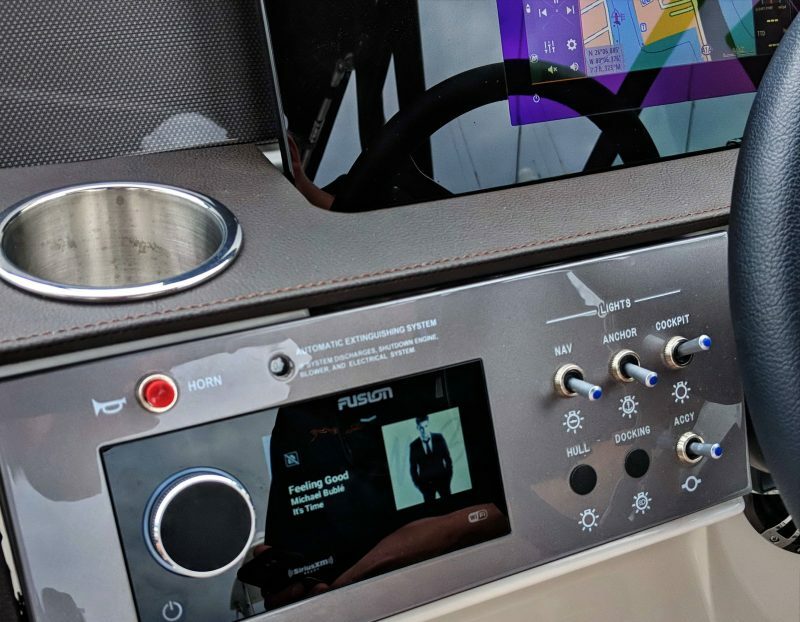 While you can learn a lot about the Apollo Series online, I attended Fusion’s press event in Fort Lauderdale last week, where the company’s principals demonstrated audio systems on six different boats. Yes, it did sometimes feel weird cruising up and down the same stretch of ICW — occasionally on plane, and often at high volume — but touching and hearing are believing. 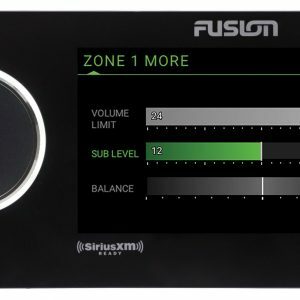 There’s much to justify the high customer expectation Fusion is setting, as well as the company’s dramatic challenge to the marine audio competition. Before I attempt to cover Apollo’s major features, let’s note how the Sea Ray SDX290 above especially speaks to Fusion’s “industry recognized” claim, as well as the wide variety of boats Apollo can serve. Also announced last week was Sea Ray’s commitment to standard fitting complete Fusion audio systems in all 40 of their current models, which run from 17-foot open sports boats to 65-foot motor yachts. 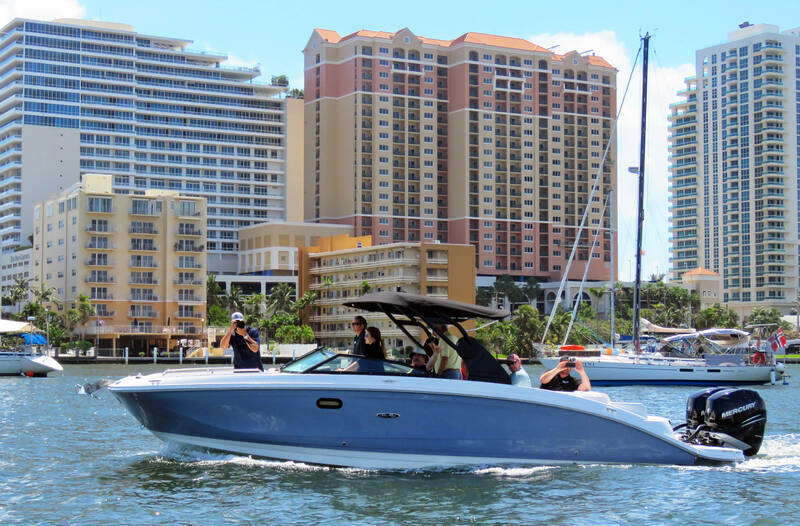 Though a prototype, the Sea Ray demo boat also illustrated how beautifully the flagship Apollo RA770 audio head unit can flush mount into a modern style helm. Note too that this panel will be glossy black on the finished SDX290, so the Apollo will almost look like part of a long black glass slab. 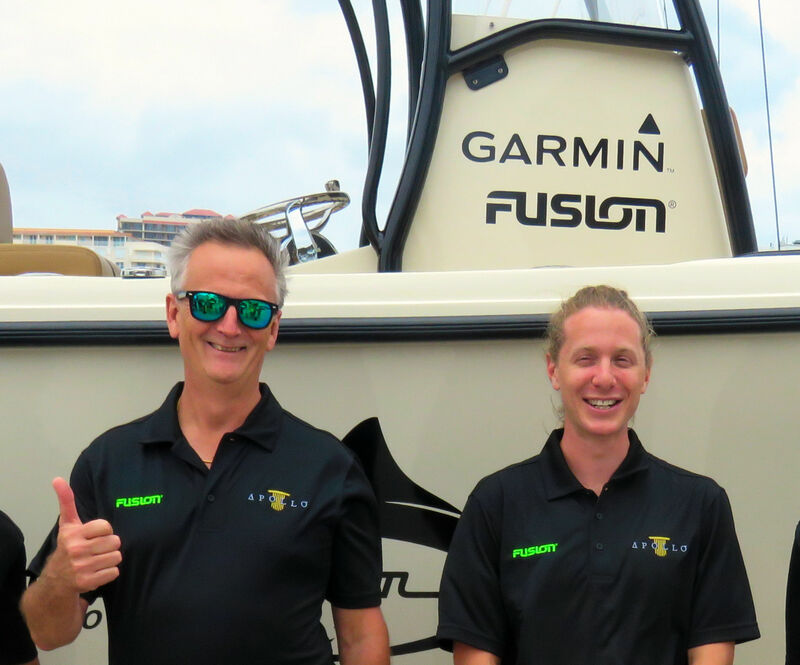 And while I’ll get deeper into Fusion’s relationship with their owner Garmin below, that is a Simrad NSS evo3 showing Fusion-Link audio controls above. In fact, there were no Garmin logos on this boat, and we were told that Simrad Fusion-Link will soon be updated for Apollo features, as will the Raymarine MFDs that come standard on other Sea Ray models. So what’s the difference between this Apollo 770 display and the one on the Sea Ray? Right, this one emulates normal stereo button controls like pause, next track, and menu, which are not visible on the Sea Ray. That’s because of a slick multitouch feature called Gesture Mode. The controls disappear after about a minute of the initial activity screen above — while the track info and associated graphic go full 4.3-inch screen — but you can then tap anywhere on the screen for pause/mute, or swipe either way to quickly get to the track or station you want. I’m pretty sure that users will quickly be doing this almost without taking their eyes off the water or nav displays (and I want a refund on all the time I’ve spent fumbling for little mute buttons). Off topic, but another difference between the two 770 images are the rounded end caps that can both improve the looks of a surface mount and also cover the hole you may already have for an earlier Fusion stereo. The RA770 is strikingly compact given all that’s packed inside, just 6.6-inches (168mm) wide without the end caps, 7.6-inches (192mm) with, and less than 4 inches deep (which includes a cowl to help protect all the input/output cables we’ll get to). And the 770’s baby brother, the Apollo SRX-400, is crazy tiny at 3.4-inches (86mm) wide without end caps, 2.8-inches (70mm) high, and slightly less deep than the 770. 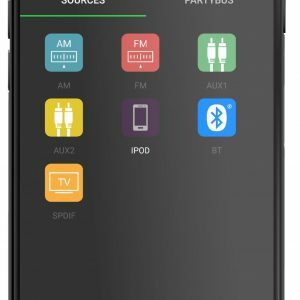 Its 2.7-inch color screen is not multitouch, hence the permanent control buttons, but the 400 can still serve as a standalone stereo with many features of the 770, and lots more when networked with a 770. And how about the big volume knobs on both Apollo head units? Fusion engineering manager Graham Brain more accurately calls them rotary encoders because they can do much more than volume, like scrolling album lists and setup menus, and managing director Chris Baird explained how Fusion polling indicates that 9 out of 10 boaters prefer a volume knob, and thus it remains even though some boatbuilders were lobbying for a 100% touchscreen. 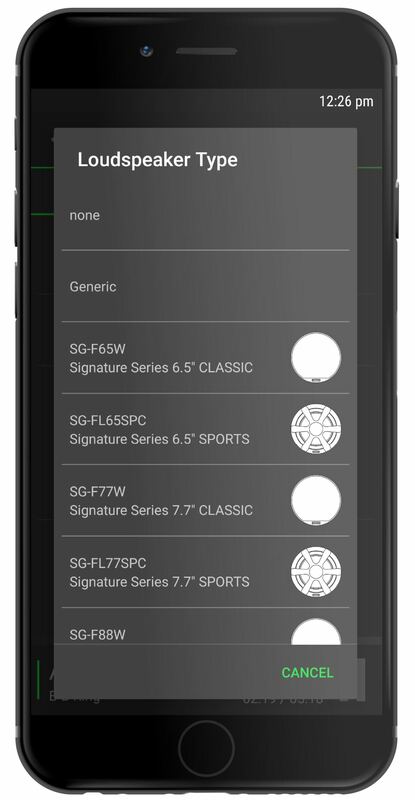 At any rate, here’s a selection of Apollo interface screens that can be accessed by touch, button, or knob, all of which I found quick and easy (when I could get past my fellow scribblers). 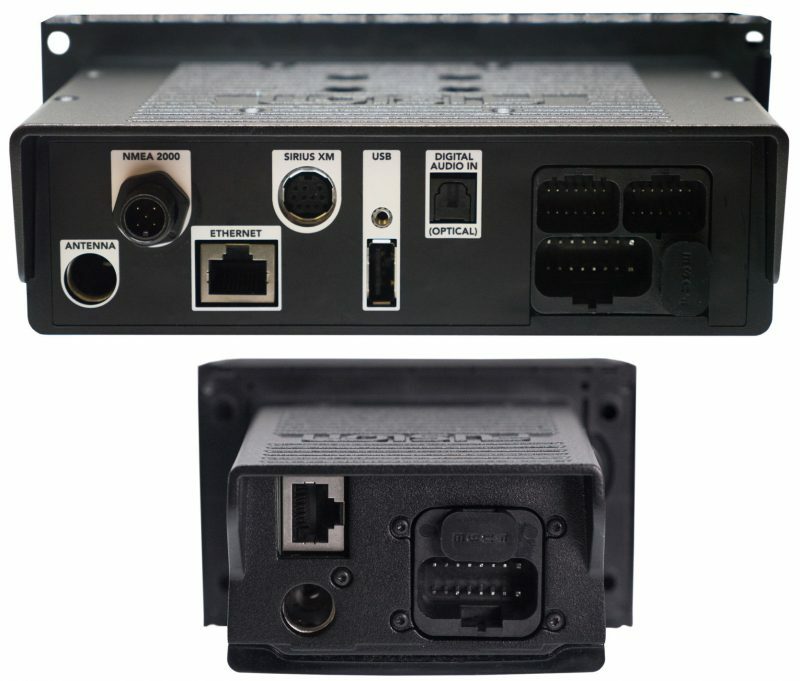 Either or multiple Apollo head units can also be controlled by existing Fusion NRX remotes, MFDs using NMEA 2000 or Ethernet, mobile apps using BlueTooth or WiFi, and the ANT wireless found in many Garmin watches. But there’s more to Apollo control interfaces that even all that. This diagram depicts a possible Fusion entertainment network on a bigger boat. In the main salon is an Apollo RA700 and let’s assume that two of its four output zones are used for two pairs of speakers in the cabin, while another goes to an amp and cockpit speakers. 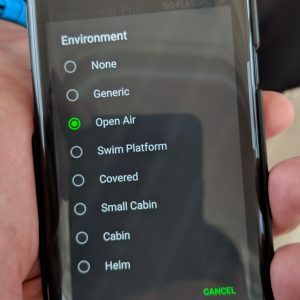 So the closest fixed control for the cockpit zone is that MS-NRX300 attached to the boat’s N2K network, though most any of the boat’s MFD can also do the job, or a phone running the Fusion-Link mobile app. While the audio source in the cockpit and salon will always remain the same, the flybridge and master stateroom SRX400’s mean that each has independent source choices. But notice the WiFi (or Ethernet) links between the Apollo control heads, and say hello to PartyBus. I saw and heard PartyBus in action on a lovely Leopard power catamaran, and it seemed like an easy to multisource stereos. 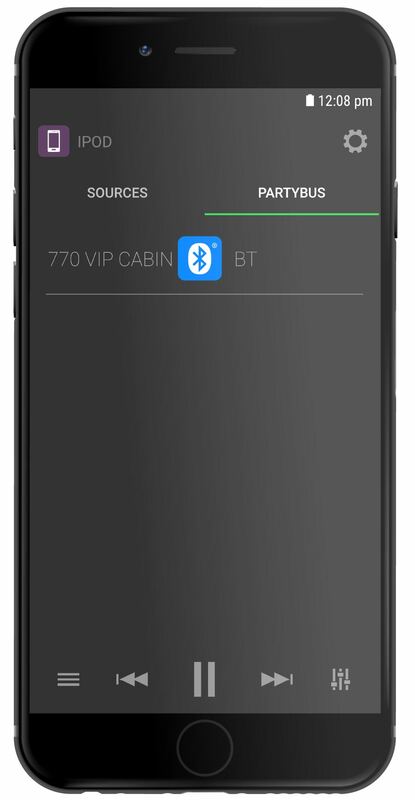 If you were in the cabin with the SRX400, it was just like having your audio system (called Personal Mode) until a couple of button taps joined you to the PartyBus, which in the Leopard’s case meant sharing an audio source with an RA770 in the main salon. And the music synced across the two otherwise standalone systems perfectly, with zero lag in places where you could hear all speaker sets at once. The screens above show PartyBus being invoked on a 770 and apparently the networking is multilateral in the sense that numerous 770 and 400 control heads can join and share control of the network sound as the users at each Apollo choose. 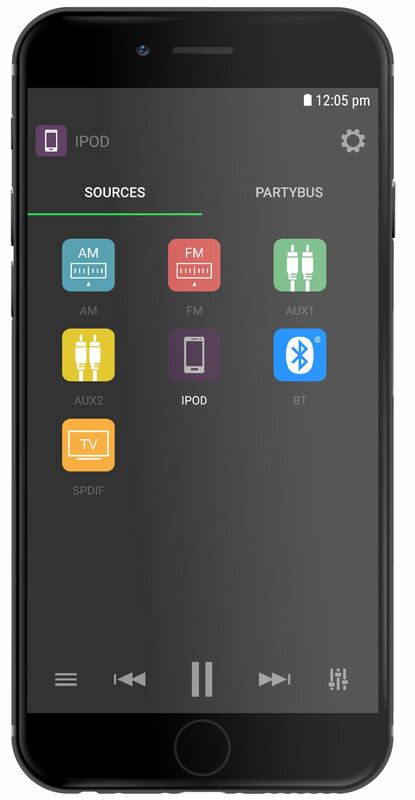 Moreover, in PartyBus mode, the more limited 400 gets access to the whole interesting suite of 770 audio sources (see below). Did you notice the oddball fifth (and unnetworked) component in the diagram? That’s Fusion’s new all-in-one Panel-Stereo also seen installed on the catamaran (above left). 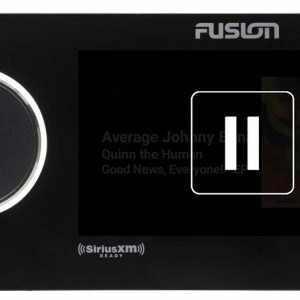 It’s based on the technology used in Fusion’s StereoActive marine portable, which means it can deliver voice prompts to help you work the controls without a screen and also that DSP (Digital Signal Processing) is trying to maximize the speaker audio quality including the tuned enclosure. The Panel-Speaker sounded good in one of the Leopard’s sleeping cabins and actually could have joined the PartyBus, though in the old school way of using an unamplified RA770 zone output with the Panel’s Aux In. Meanwhile, another cabin had the SRX400 using Fusion’s similar-looking Sound-Panel speaker system. 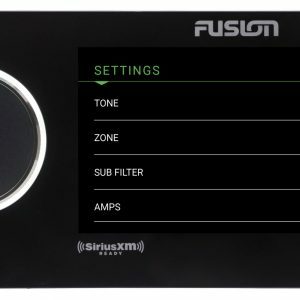 Fusion (and others) offer all sorts of amplifier, speaker, and subwoofer options that could work with an Apollo network, but let’s move on. The RA770 source screen above is worth contemplation and detail. 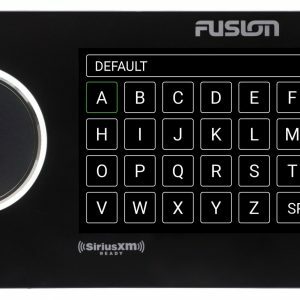 For instance, Fusion told us that Apollo’s SiriusXM abilities include the ability to support at least some of the next-gen features now coming to vehicles. And note the Optical In source, a fiber cable option that can supposedly work well with many media sources like your boat’s HDTV. But it’s UPnP that may really get your attention. While I’m just learning about UPnP at sites like this, I already know well the sound quality and range limitations of BlueTooth audio streaming, convenient as it is. So while the scenarios Fusion diagrams above — audio apps using the UPnP standard to stream over WiFi to an Apollo network — are just starting to become commonplace, I look forward to experiencing it. 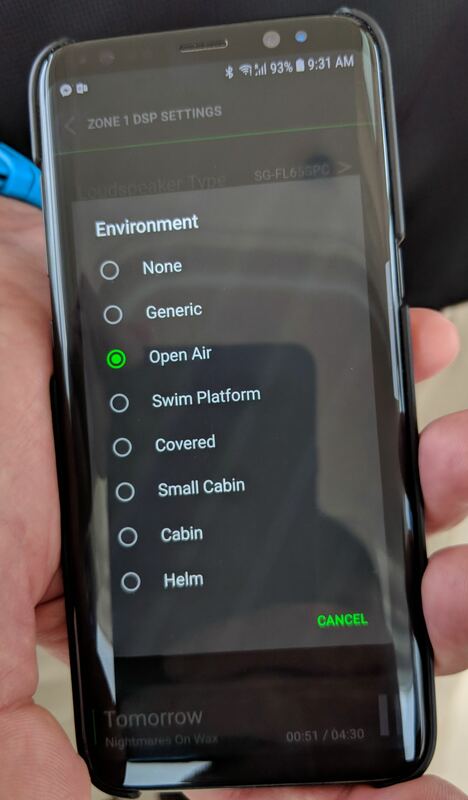 Incidentally, Apollo head units are happy to join a boat’s existing WiFi network instead of creating their own, so this sort of streaming could be done while still maintaining contact with other WiFi gear on the boat (which is also nice when using the Fusion-Link remote control app over WiFi for greater range). UPnP is not just WiFi, either, and when Fusion engineer Brain told me about how well Apollos can browse and stream a media server, he also recommended Ethernet as the preferred connection, especially for large audio libraries. 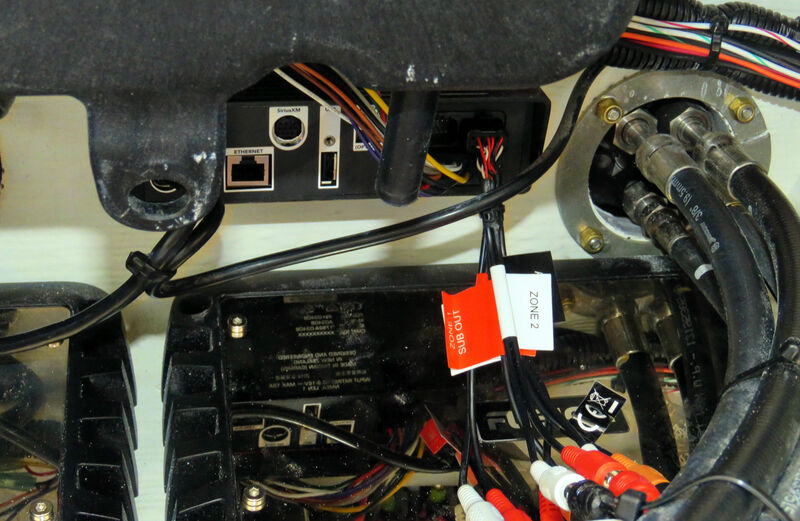 Speaking of wiring harnesses, here’s how an Apollo RA770 can look when installed inside a center console. Multi-zone stereos can involve lots of cables and connectors and, yes, this custom Streamline had at least two Fusion amps and many Signature speakers. 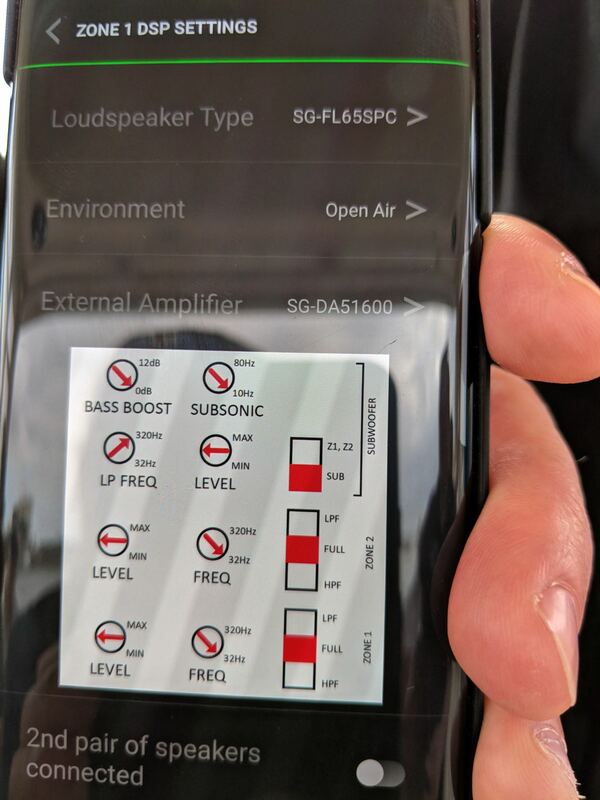 It’s hard to get big, clean audio everywhere on a fast open boat, but it certainly can be done. A much-touted Apollo feature is DSP, but digital sound processing is such a vague term that I wish I could lead this section with a virtual reality clip that gave readers a chance to hear and feel what we did on the demo boats. But of course the effectiveness of that would depend hugely on the quality of your VR player. What I can tell you is that even the Sea Ray demo install, which only included two 6.5-inch Signature speakers, sounded quite full and clean (Sea Ray will offer bigger Fusion packages as options). Meanwhile, the bigger systems sounded awesome, and sometimes led writers to spontaneous giggle fits, air guitar sessions, etc. More specifically, I never heard a disconcerting volume level change when switching sources or distortion at extreme volumes, which are the Volume Equalizer and Feed-Forward Limiter functions of Apollo DSP. Nor, to my knowledge, did we blow out any speakers, which is another benefit of the technology. 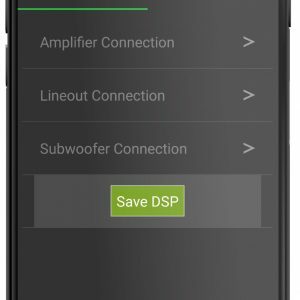 While those DSP features just happen without settings, and apparently work to some degree with third party amps and speakers, Apollo DSP also has a specific Fusion aspect that can be seen in the Fusion-Link app screens above. In short, they have audio profiled all their own speakers and amps so that the DSP can better match the output to where it’s going. I suspect this contributed significantly to the good sounds we heard, but also aware that it’s a clever attack on the popular combination of Fusion head units with JL amps and speakers. Fusion managing director Chris Baird and marketing manager Marcus Hamilton were understandably thumb’s up giddy by the end of the press event, which in some ways also marks the end of an intense development process. As bold as they are with their project Apollo claims — yes, the name also references the push to put a man on the moon — they’ve delivered a lot and certainly what seems like a platform that is already nicely future proofed and with room for more Apollo models and peripherals (like amps that can be tuned via app and DSP). 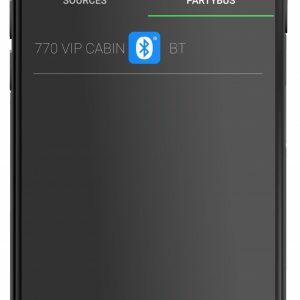 The RA700 and SRX400 are slated to become available in June, at retail prices of $649 and $349 respectively, and I hope to test a PartyBus network in depth at some point. As for Garmin, the logo on the Streamliner above was one of the few to be seen, and I think the boat is Garmin MFD equipped anyway. Fusion has been under their ownership for four years now, and hopefully the fear that they will only play nicely with one brand is over. But that certainly doesn’t mean that Garmin isn’t involved. Baird talked about how they helped double the Fusion engineering staff from 20 to 40 — once they’d been persuaded to back project Apollo — and engineering manager Brain told us how nice it was to be able to query his Garmin colleagues on subjects like optically bonded displays and embedded WiFi radios. 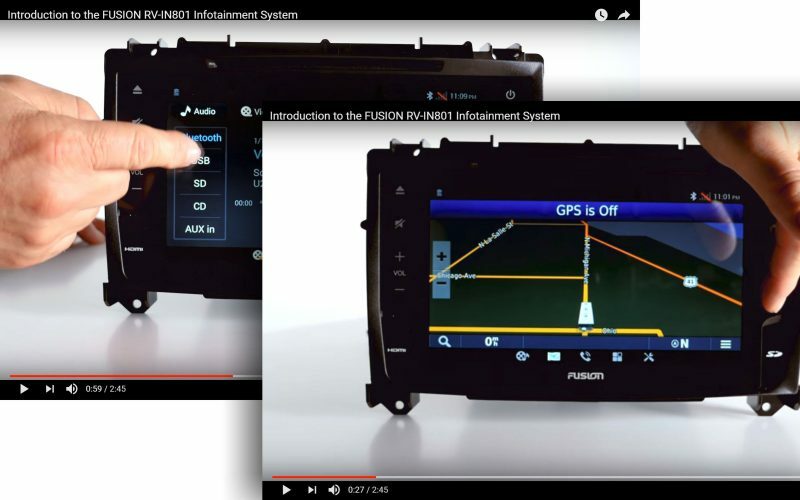 I also learned that in the world of recreational vehicles — which the independent Fusion sales force penetrated first — there are now joint Fusion/Garmin developments like the RV-IN801 Infortainment System (clips below from this YouTube video). In fact, one upshot of Garmin’s recent Trigentic acquisition will be similar RV systems with digital switching included. But even if Garmin/Fusion become one brand in that world, it may mean nothing in ours, because — hail Apollo — Fusion seems to be doing just fine functioning as an independent. Next story Uniden MHS335BT handheld: VHF, GPS, DSC and texting! 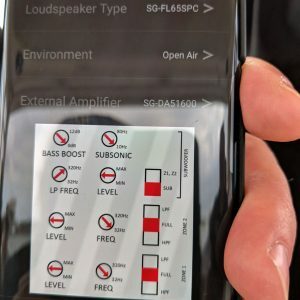 As I read the press release and then this article I am made to wonder about whether 5.1 surround sound is next for Fusion. They’re following a lot of parallels with Sonos who eventually used their audio syncing abilities to produce 5.1 from multiple linked components. Fusion could certainly do this and seems to be really close. I think the one thing they’d need to add from a hardware perspective would be HDMI pass-through to make it seamless. 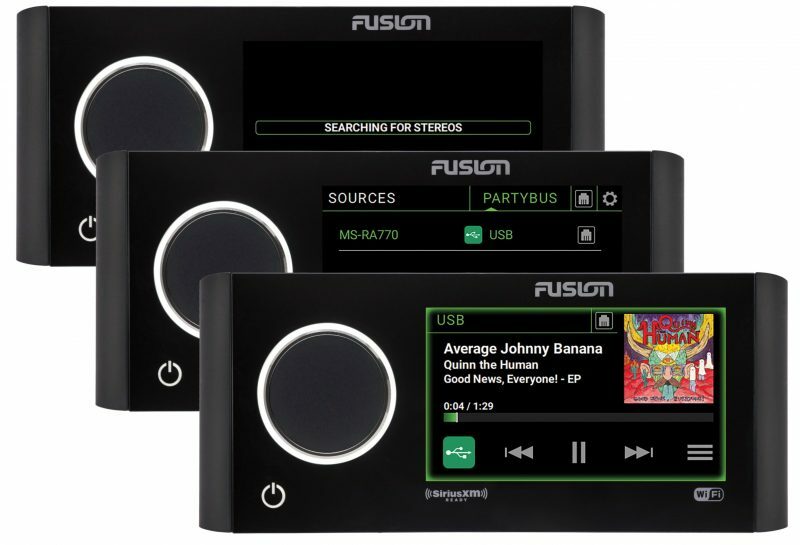 Incidentally, Fusion cannot yet declare the Apollo Series compatible with Apple AirPlay but apparently it’s very much in the works. So maybe Ben S or someone can compare AirPlay to UPnP? I’m glad to see innovation here. I love music, and play it wherever I am, and especially on the boat. I’ve had Fusion products since they came onto the market, and believe there are none better for the boating world, but it has been pretty stale the last few years in terms of new features. These new models show that there is still engineering prowess at Fusion and ideas to make our lives easier while on the water. In particular, I love how they re-imagined the size and shape of the devices. 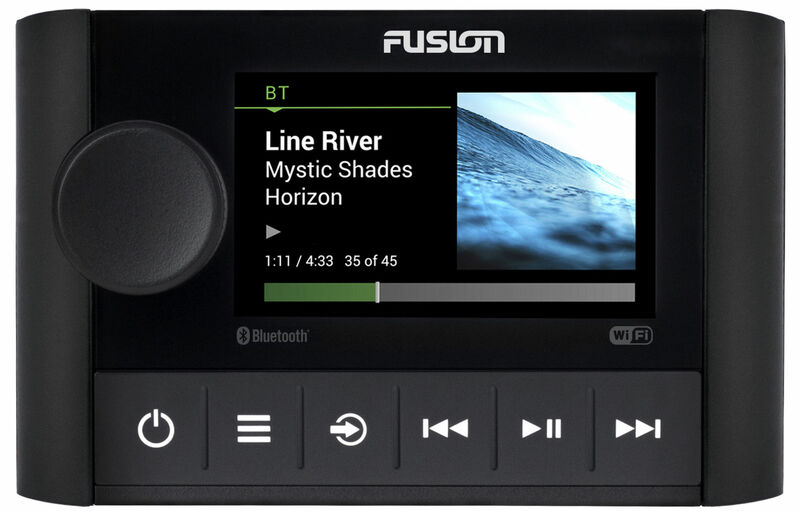 I removed one of the older Fusion units from my previous boat before selling it, and its shape was similar to a standard car stereo, but even deeper and heavier. Moving towards a smaller depth solution with a bigger screen is definitely the way to go – we’ve seen this trend in cars for the last few years as well. 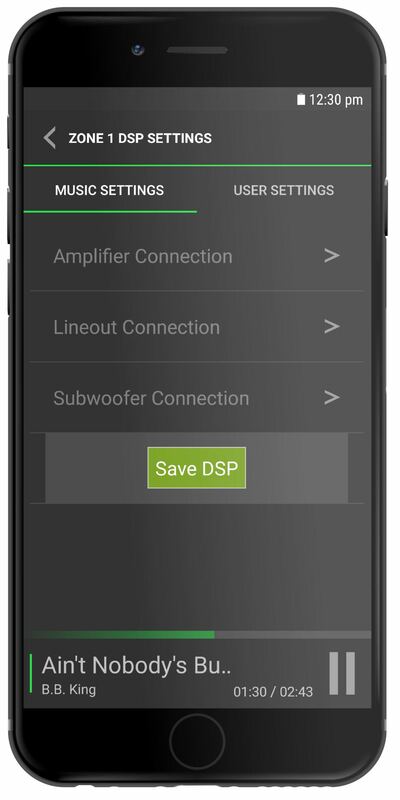 The other software features – adding DSP, PartyBus networking, etc. – are good to see as well, and I can’t wait to see them in action! Nice to see some competition in the field. One question I’d like to know is whether they have (or plan to) support internet streaming services such as Tidal. I had thought that the WiFi capabilities would have allowed this to happen, and I have read that WiFi was a *source* for the music on some of the sites. But I can find nothing in the manuals to support this. This is why I had Sonos on my last boat. Yes, I know I can Bluetooth Tidal l from my phone or another DAC but that will degrade the sound quality. I would hold off being an early adopter with the Apollo series. I have a 770 and a 400 on a wired network and they are very unstable when they are linked, the documentation isnt accurate, the Fusion-Link app is flakey and support doesnt reply. They are also absorb a lot of bandwidth on the network and I have a gig Ethernet. 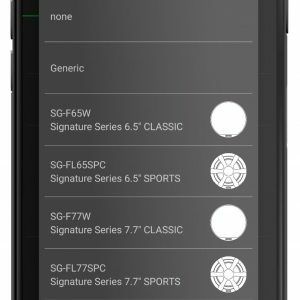 What have people been seeing as far as FM radio reception on Apollo. This has always been a weak area for Fusion and once in a while we have a customer for which FM reception is very important.